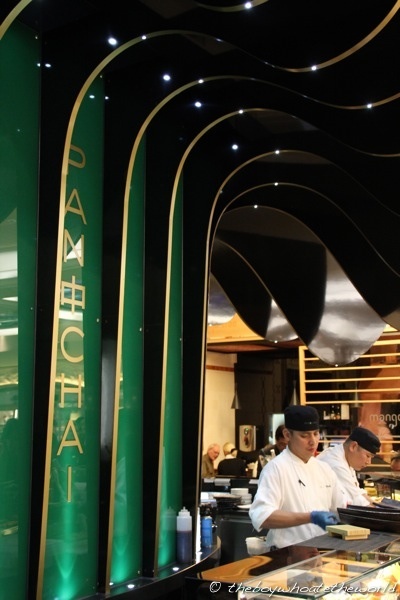 Nestled in the food halls of the world renowned Harrods store in Knightsbridge, Pan Chai is the brainchild of restaurateur Eddie Lim – owner of the Mango Tree group which includes their eponymous flagship Thai restaurant in Belgravia. Launched in April of this year, the cuisine at Pan Chai is largely Japanese inspired with classics like sashimi and tempura mingling with other far east delicacies from the likes of Malaysia and Korea. Of all the eateries at Harrods, Pan Chai’s ultra-contemporary food bar is easily the most striking. 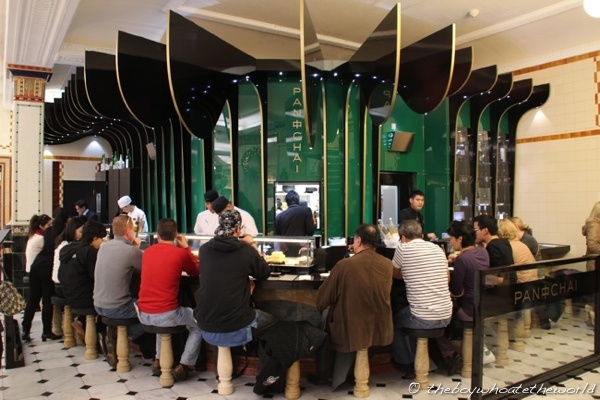 A glossy wave-like awning wraps around the restaurant’s kitchen… black curves juxtaposed against a stunning jade green and gold backdrop. Despite it being the middle of the week, they had a buzzing lunchtime trade going for them… almost every seat at the bar was filled with well-heeled shoppers and passer-bys tucking into dishes being prepared in real time by the team of chefs behind the counter. 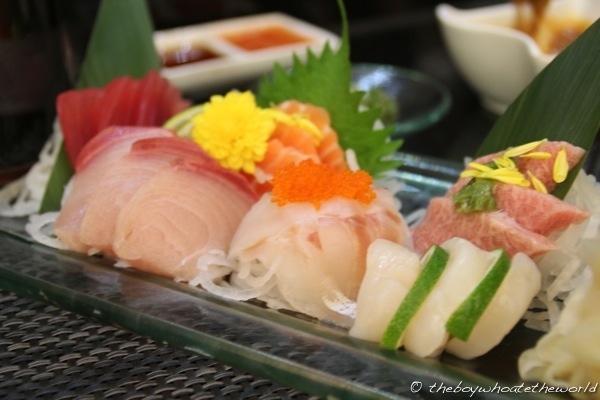 We started with a chef’s selection of nigiri and sashimi. 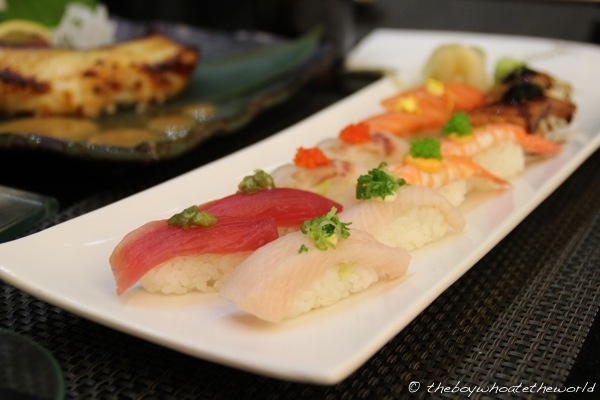 The nigiri was expertly made – each perfectly formed and garnished intricately with individual condiments ranging from wasabi relish to generous piles of roe which lifted the classic fish, shrimp and unagi toppings. The sashimi platter, served with dry ice that was billowing away theatrically, was a bit more of a mixed bag. Some pieces were seriously good… their gorgeous melt-in-the mouth fatty tuna and juicy-sweet scallops stood out in particular. Other staples like the tuna and seabass were more ordinary and a bit too thick-cut for my liking. 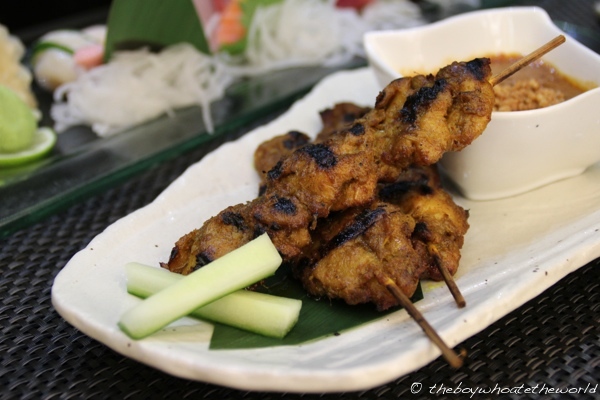 Next up, Malaysian-style chicken satay with peanut sauce – a dish which featured at their South Kensington based Awana restaurant before it shut down recently for relocation. Made from succulent corn-fed chicken, these glorified, super-sized skewers are easily double if not triple the size of the average satay sticks you get from Malaysian street vendors. Dearness aside (it’s a rather hefty £12.8o for a trio), the chargrilled turmeric-based flavours were pretty authentic, even by local standards. Best of the lot of dishes we sampled had to be their chargrilled Chilean seabass. And a whopper of a fillet it was. 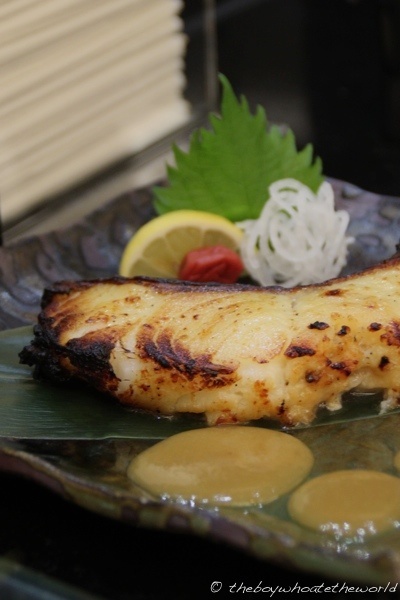 The luscious, velvet-like flakes of fish were rich and buttery… the fruity sweetness of the plum and savoury depth of the miso complemented the fish beautifully. A stonkingly good dish. Service on the whole was friendly and professional. Perhaps they could have given us a bit more time between one dish and the next, but we were otherwise very well looked after by their polished front of house team. Credit also has to be given to executive chef Ian Pengelley and his team. Pan Asian restaurants so often lose their way dabbling into fusion, hence it’s refreshing to see Pan Chai stick to their guns, staying true to the origins of the respective cuisines which feature on their menu. You can’t fault the quality of the top notch produce here either. Quality does come at a price though and a lunch stop here, particularly if you indulge in more decadent options like their sashimi or wagyu beef dishes, could easily set you back more than £40 a head. But hey, you’re in Harrods at the end of the day… you wouldn’t normally come here to stinge would you?